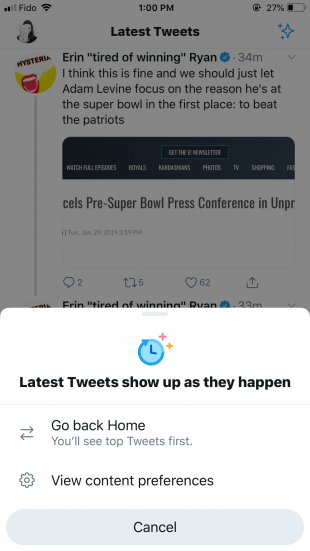 Yes, Twitter brought its chronological timeline back with the Latest Tweets feed. But the algorithm is still in play in the Top Tweets feed. 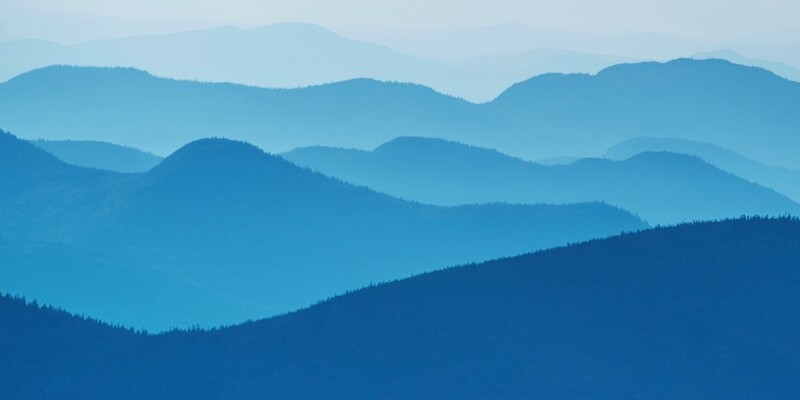 Read on to learn about the recent Twitter algorithm changes, and how your brand can optimize tweets for maximum organic reach. When Twitter launched in March 2006, its timeline structure was simple: Tweets were displayed in reverse chronological order. In other words, each user’s feed contained tweets from their followers, from the most recent tweets onward. The timeline undergoes its first significant tweak. Instead of only showing content from followers, feeds start to include recommended tweets, topics, and accounts. In early 2015, Twitter introduced a “While you were away” feature. As a forerunner to “In case you missed it,” this module was meant to provide users with a recap of notable tweets they might have missed. Using the same algorithm applied to “While you were away” content, Twitter began to push the “best tweets” to the top of feeds. The company’s first foray into algorithmically restructuring timelines was met with #RIPTwitter backlash. In retrospect, the outrage was probably a bit of an overreaction, especially since users just had to refresh their feeds to switch back to chronological. Having not died—in fact, the algorithm drove more engagement from users—Twitter only slightly refined the algorithm in 2017. In an effort to be more transparent, Twitter explained tweets were being scored on a relevance model, designed to predict which content users would find interesting. Twitter also replaced While you were away with In case you missed it. 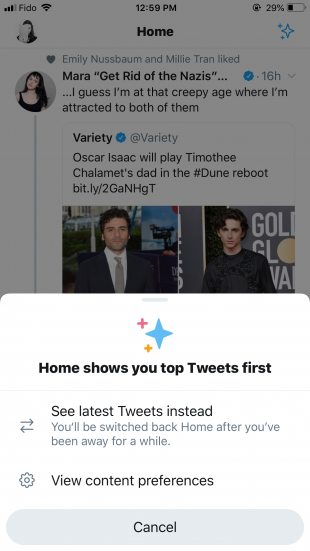 In September 2018, Twitter announced that users would be able to toggle between Top Tweets and Latest Tweets. What that means is people can now easily switch between an algorithm feed and a real-time feed. Top Tweets: An algorithm-powered feed organized by ranking signals. In addition to ranked content from followers, this feed will sometimes feature Who to follow suggests, and content from other accounts. Users can also provide feedback on content shown in this feed by selecting Show less often. Latest Tweets: A reverse chronological feed of tweets from followers. ICYMI: A short algorithm-powered module of top tweets. The more time a user spends in the app, the less likely they’ll see this. Happening Now: This section may occasionally appear at the top of user timelines, featuring events or topics of interest. Trends for you: An algorithm-driven section that highlights popular trends and hashtags for users. Under Content Preferences, users have the option to allow Twitter to personalize this content based on their location. At the beginning of 2019, Twitter made several announcements hinting that there will be more changes in store for its algorithm in the future. At CES, the company shared that it would begin publicly testing conversation features with users. And in January, Twitter announced it would be partnering with researchers at UC Berkeley to study how it could improve the performance of machine learning on its platform. Despite modifications over the years, Twitter’s CEO, Jack Dorsey, has been insistent on maintaining a real-time platform. The primary domain of Twitter’s algorithm is the Top Tweets feed. How recently the tweet was published. How many Retweets, clicks, favorites, and impressions a tweet has received. The tweet’s engagement relative to other tweets from the same user. How often people engage with the tweet’s author, through active engagements and impressions. The type of media the tweet includes (image, video, GIF) – and even polls. The type of media users tend engage with. For example, a user that often engages with video is probably more likely to see more tweets with videos. How long a user has been away from the site. How many followers an account has. The account’s location relative to users. For any brand, the more positive engagements you have with your followers, the better. But consistent engagements can earn credit with Twitter’s algorithm, too. When a follower regularly engages with your account, it increases the likelihood that Twitter’s algorithm will share your content with them in the future. Don’t count on the In case you missed it feature to rescue your unseen content. It’s critical to tweet during peak engagement hours, especially since the half-life of a tweet is 24 minutes. Hootsuite research shows that the best time to post on Twitter is 3 p.m. on weekdays. But you should also check Twitter Analytics to find out when most of your followers are online. Don’t forget to plan around events, too. Under Armour’s #BreakTheGame campaign starring NBA superstar Stephen Curry is a good example of this. The athletics retailer realized Curry’s fans were active on Twitter every time he scored a three-pointer. So Under Armour created content to drop with every three-point basket. Branded hashtags are a great way to gain traction on Twitter. Just look at Nike’s Colin Kaepernick-fronted #JustDoIt launch, or Gilette’s viral #TheBestMenCanBe campaign. Hashtags can drive brand awareness and engagement, which can translate to algorithm recognition. Or, land your hashtag in the Trends for you section. Pandora Music’s #SoundsLike campaign was a clever way to spark conversation and engagement. The company asked Twitter users to tweet an emoji with the hashtag, and @pandoramusic tweeted back what it thought the emoji would sound like. Twitter stats consistently show that rich media gets higher pick up. Tweets with video can bring in as much as 10 times more engagement. Don’t forget GIFs, too. A Twitter study found that tweets with a GIF received 55 percent more engagement than those without. Polls are fun way to engage with Twitter users, and they have the added benefit of providing feedback. To gage interest for Mayochup, a blend of ketchup and mayo in a bottle, Heinz created a poll on Twitter. More than 900 thousand votes and 2.4 billion impressions later Mayochup was on its way to grocery stores. Even if you tweet at peak times, chances are many followers may have missed your tweet. If content performed well the first time, it likely will again. But don’t simply Retweet or copy your top performing content. Find creative ways to repackage and re-share what works. It’s just good business practice to reply to customer mentions. But remember, one of the Twitter algorithm’s ranking signals is based on account engagement. Plus, people who receive a response are 44 percent more likely to share their experience, and 30 percent more likely to recommend your brand. A lot can be accomplished organically. But if your budget allows, a little promotion can go a long way. Check out our guide on how to use Twitter ads. Having a higher follower account lends credibility and is a factor for the Twitter algorithm. Luckily, we’ve amassed 41 tips to help you get more followers on Twitter. When it comes to algorithms, there are no one-size-fits-all solutions. Use Twitter Analytics to track what works and what doesn’t, and tailor these tips accordingly.